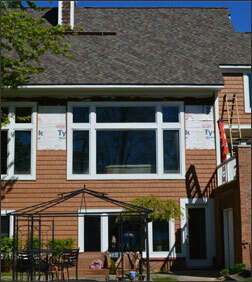 Renovations Roofing and Remodeling, Inc. is a family owned and operated business headquartered in Highland, Michigan. Additionally, we’re known for our dependable quality siding and window services and for providing our customers with the best products. At Renovations Roofing and Remodeling, Inc., you will receive outstanding customer service on all your projects. Our experts offer comprehensive reporting so we can analyze the problem areas together and come up with the best solution. With digital imaging, we can see what your new siding and windows will look like when we are done. From vinyl, wood shake, composite, and custom product patterns, Renovations Roofing & Remodeling, Inc. offers a wide range of siding options to protect your home or business. In addition, we have manufacturer warranties available along with great financing options. If you are looking for skilled workers and professional services, then you came to the right place. Renovations Roofing & Remodeling, Inc. provides both masonry and insulation work for home and business properties. At Renovations Roofing & Remodeling, Inc., we provide 100% satisfaction guaranteed on all of our services. As a result, you can be rest assured that your siding and/or windows project will receive the highest quality in services, professionalism, and products. For more information, please contact us or call today!